Active Learning is a facet of education that challenges the intellectual capacity and comprehension levels by implementing real-life, imaginary situations. To put it simply, learning by doing is most important. 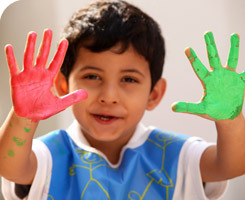 Hands-on learning or experiential learning helps children to engage themselves in an activity that focuses on building verbal/non-verbal communication skills, fine and gross motor skills, as well as cognitive and creative capabilities. Kids Palace Nursery offers active learning programs for children that are customised to strike the right balance between fun and learning. Our innovative approach towards learning involves a play-based curriculum with a well-planned schedule that encourages kids to learn in a friendly environment and helps them progress at a rapid pace. Our professional tutors will ensure that every child achieves mastery of the given concepts at their own pace, while enjoying every bit of the learning process. We believe in equipping a child to overcome the challenges that modern education presents rather than having problems arise and trying to react to them. A child who is part of our nursery will show improvement in behaviour, attitude, focus and concentration. Kids Palace Nursery adheres to the standards set by the Early Years Foundation Stage Framework in regard to the seven areas of learning and development. This helps chart the developmental stages of a child from birth to 5 years. All areas of our curriculum, at every stage, is enriched and developed through the active learning approach. Active learning can support children’s development by encouraging them to become successful learners, confident individuals, responsible citizens and effective contributors. These seven areas of learning and development are covered through art, singing, dancing, story-telling, and many other interactive learning sessions and fun activities. The expert staff at Kids Palace Nursery have a role as leaders of learning in helping to bring about improvement in your children. We believe that our social forums would create a strong sense of community where we could work along with parents in celebrating and developing early childhood education the active way!